It had not been a good day : the night was even worse . A long day of agitated drinking and violent confrontations had led finally to a street fight resulting in a confrontation with NYPD in front of Ray's Candy Store . There was no arrest but the drinking and fighting had taken their toll and though the anger was still clearly red-in-face in degree , he was soon to pass-out in front of Alphabets , the store next-door on the up-town side of Ray's . 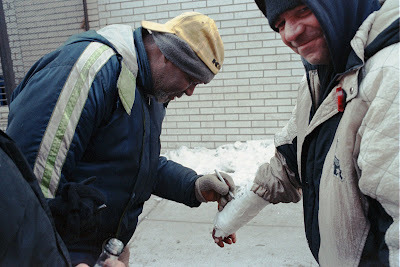 One winter afternoon a few years ago , outside the Key Food grocery on 4th street , Larry was attempting with considerable difficulty to sign Mike's cast with his left hand . Of course both had been drinking and were at least a little high . But beyond the limit to co-ordination due to the effects of alcohol Larry was also right handed and it was simply a difficult task to sign his name with his left hand . 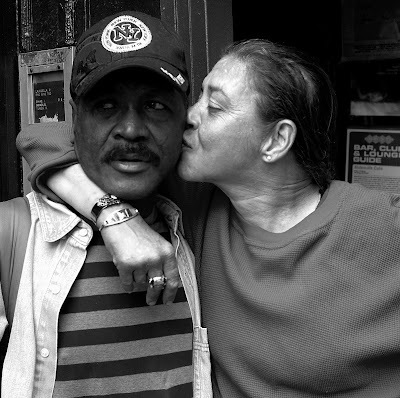 A few months earlier Larry ,who has since passed on , had been on his way to an out-of-the-way spot deep inside an un-used tunnel at the F train stop on first avenue , a place where he and many others routinely slept in cold weather because it was out of the weather and warm . Larry being quite drunk did not make it all the way to his usual sleeping quarters inside the subway tunnels . Larry either passed-out or fell asleep on the subway tracks and a train severed his right hand . The train nearly removed one lower leg too. 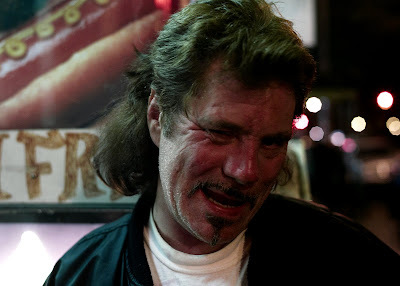 On a more recent night while on his way to the same sleeping quarters deep inside the tunnels "Coney Island Mike " being quite drunk fell and broke his arm on the subway tracks near where Larry had lost his right hand .. Thus are the preceding events recounted that led to the image above . P.S. 19 July , 2009 : We talked to Larry today . Larry is contrary to what is stated above deffinitely not dead .